Every marketer’s goal is for their target audience to pay attention to and remember key brand and product messaging. So what if I told you video results in 95% message retention by the viewer? Or that 45% of people watch more than an hour of video on YouTube and Facebook each week? There’s no denying video is a powerful content marketing tool and its popularity is growing at the speed of light! But what you may not know is how affordable video has become for even the tightest B2B marketing budgets, or how quickly you can record, edit, and publish video content these days. 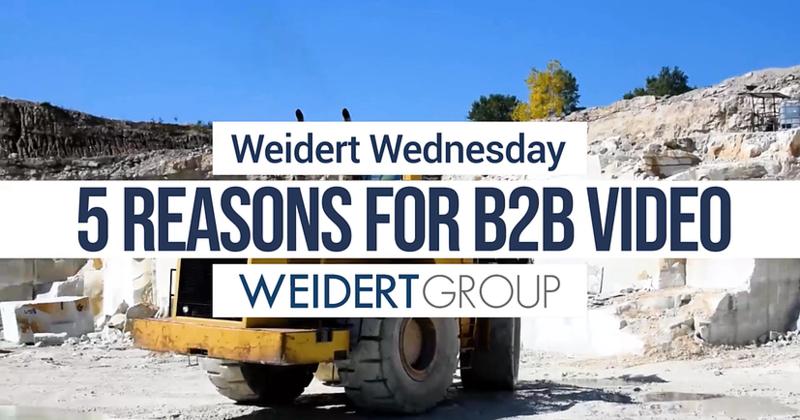 In this edition of Weidert Wednesday, I’ll give you 5 reasons to take the leap into the B2B video arena. Ask 10 people which way they prefer to learn about something: by watching a video, or reading? If their comprehension is any indication, the overwhelming majority would say video, as viewers retain 95% of a message when they watch it in a video compared to 10% when reading it in text. It’s so widely embraced, in fact, that Cisco has projected that more than 80% of all Internet traffic will be video by 2021. Want more proof that it’s a powerful marketing tool? Here are five reasons you should be leveraging video for your brand right now to get on board with this exploding content medium. One of the best things about YouTube and online video is that a lot of videos are not done by some big-name production company. Many of these videos were shot on a smartphone or basic consumer camera, edited on the device or with simple software, then uploaded. Many times your potential customer just wants to learn what your business is about or see the human side of your company that they can’t get with text or graphics alone. By using a phone or an affordable camera, you produce a snazzy video for those customers. Here at Weidert Group, we use two Canon DSLR cameras and a Rode microphone to produce our videos. Great blogging and content on your site gives a viewer a sense of your brand’s culture, but can only go so far. A video is a chance to let viewers hear your voice and make a strong first impression that could separate you from competitors. Videos give you both a great way to qualify your skills, and to provide a call-to-action as a way of leading the viewer to more in-depth information about your product or service. Yes, videos add even more fuel to your SEO efforts. You can leverage your target keywords (those that all of your content is optimized around) in the title, description, and transcript of your uploaded videos. Also, you can embed videos onto your website, basically creating new pages with updated content. Search engine crawlers love new content — it tells them that your site is fresh, relevant and worth searchers’ time. When you produce a video, you get so much more than just the asset itself. Often, you walk away from a video with the transcript and the possibility of images and GIFs (which can be pulled directly from the video). The transcript could be used for an accompanying blog (as you see below) and the images or GIFs could be used on social. Use your imagination and think of even more possibilities! Have you ever been researching a topic or looking for information only to find an article that’s “tl;dr”? If you’re anything like me you see these and quickly move to the next site, hoping to find a video. Why do we do this? Because video makes consuming content easier. Video teaches and entertains using visuals and supporting audio, which stimulates two senses for a viewer, and makes your message more memorable. So there you have it: 5 reasons you should be leveraging the power of video for your B2B company. When 52% of executives say they watch work-related videos each week (Forbes), it’s hard to ignore the potential impact of video on your buyer personas. A marketing tool that used to be out of reach for those with limited budgets is now not only cost effective but fairly easy to accomplish. But how do you get started? Check out our B2B video infographic. It explores what to consider as you begin your journey with video. Alexandria serves as the Video Producer for Weidert Group. Her work in media production has been awarded by Adobe and her background includes broadcast and social media marketing. At Weidert Group, she produces short-form videos for clients and the agency’s own marketing.